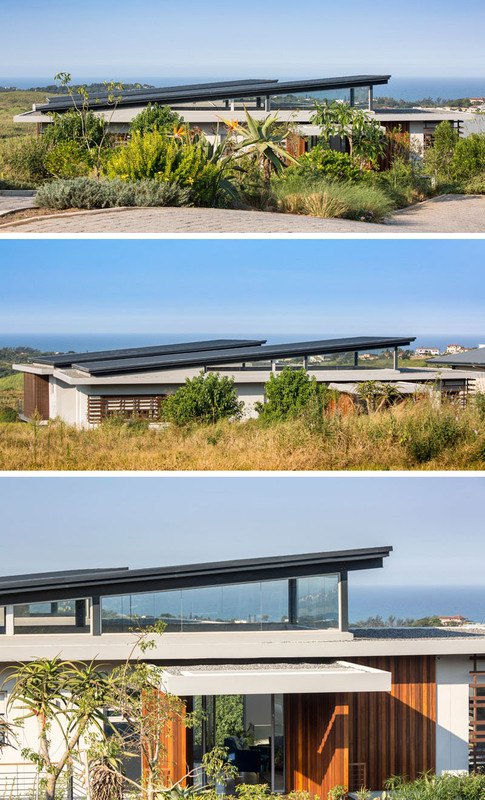 South African design firm Union3 have designed the interiors of this modern house that features an indoor swimming pool, multiple entertaining spaces and artwork throughout. 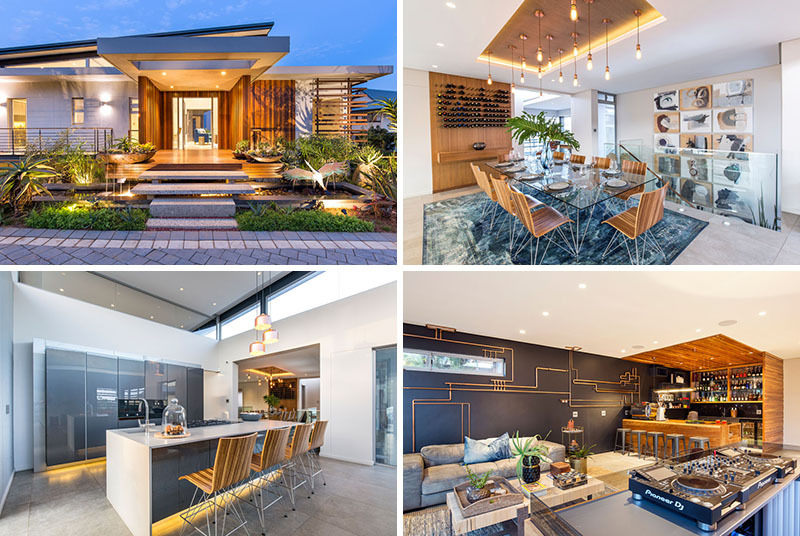 Uplighting, plants and a small pond welcome you to the home, while granite stairs that appear to be floating lead to the large front entrance of the home, that is adorned in timber cladding. Stepping inside to the top floor of the home, the focal point of the living room is a large, wood art installation of a man, designed by the homeowner. In the dining room, the glass topped dining table with wood chairs sits below multiple brass pendant lights hanging from a recessed ceiling. A large blue area rug below the table adds a pop of color to the room, and is not obstructed due to the glass table. A set of wood stairs leads down from the dining room into the entertainment areas of the house. 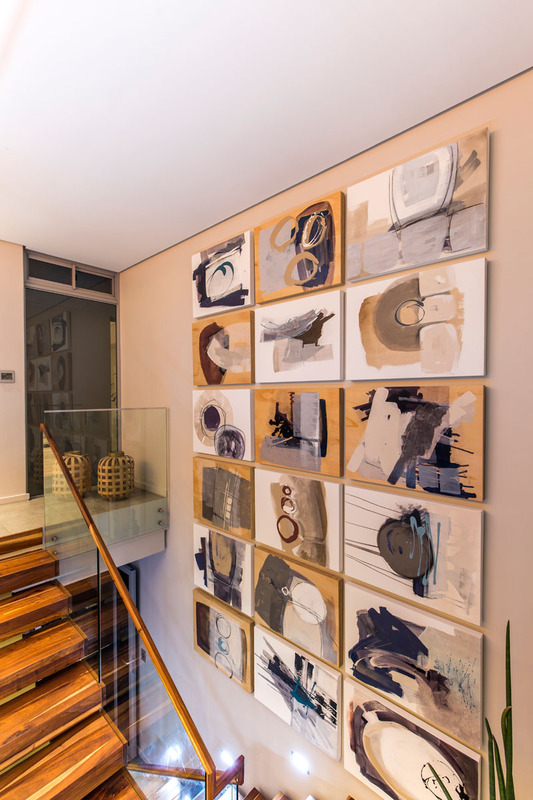 Decorative art pieces fill the wall that leads downstairs. 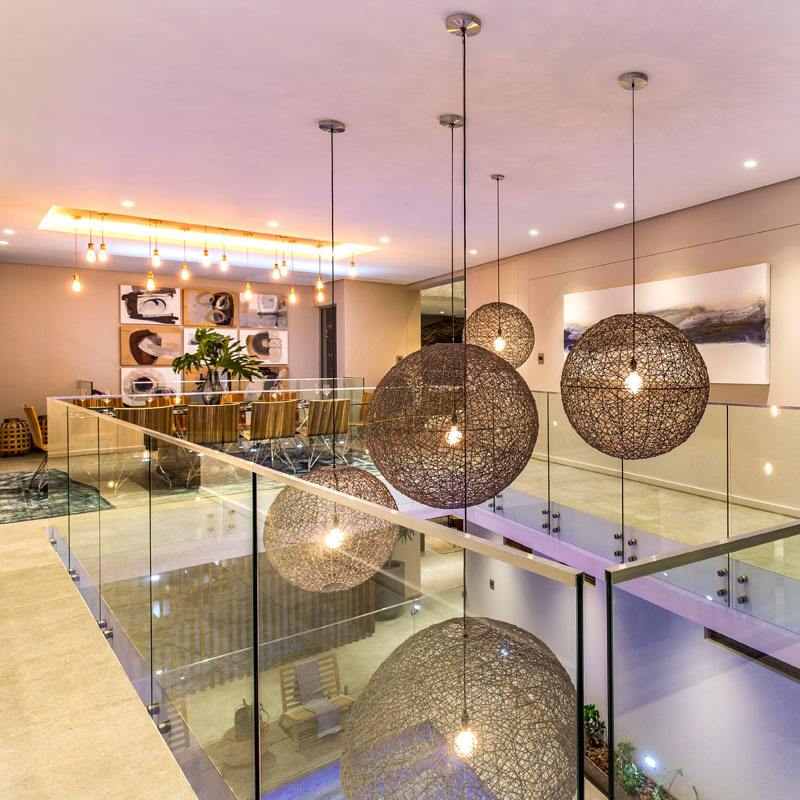 The large, round, textured pendant lights hang from the ceiling in this space, going all the way down to the lower area of the house where the indoor pool is. 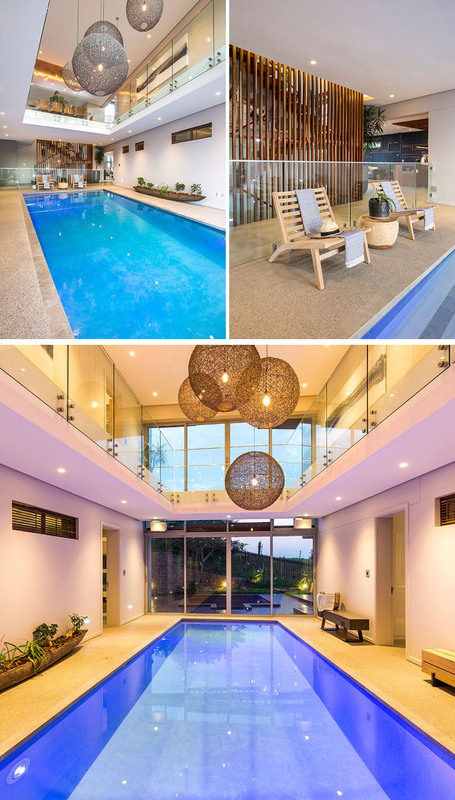 The layout of the house has been designed around the indoor swimming pool, with the hanging pendant lights making the most impact here. The blue pool reflects a warm glow due to the multiple lighting sources in the room. Steampunk inspired, exposed copper piping stands out on the black accent wall in this space. A customised DJ booth faces a grey upholstered couch, where guests can soak up music and drinks. 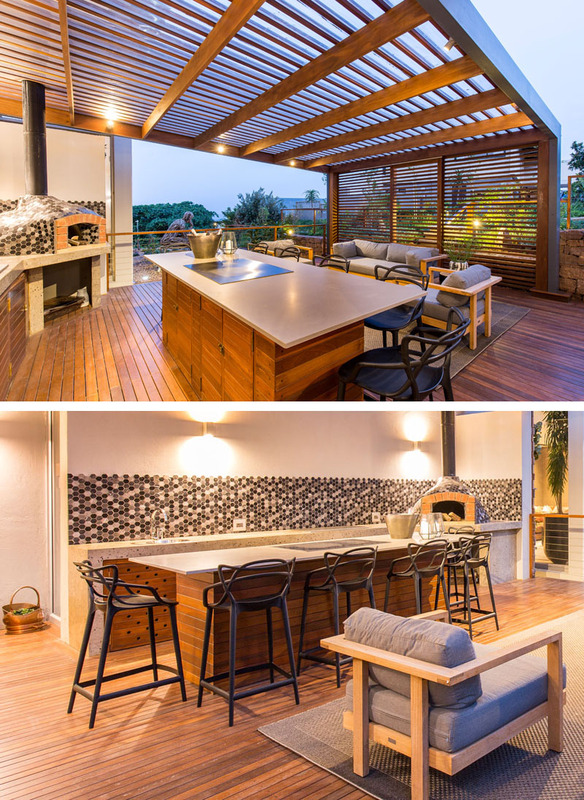 Outside, a wood pergola is set up for entertaining, with an outdoor kitchen and lounge area. A wood island with a grey countertop provides space for cooking and eating, while a prep area with a patterned tile backsplash can be used to make pizzas in the wood fired oven. Back inside there’s another living room, this time a large L-shaped, brown leather couch and a black detailed chair provide seating. Warm earth tone colors used in the decor and fabrics, compliment the mounted art piece above the couch. Surrounded by glass railings, the home office has a light wood desk that faces a window, and a brown leather chaise lounge for reading. 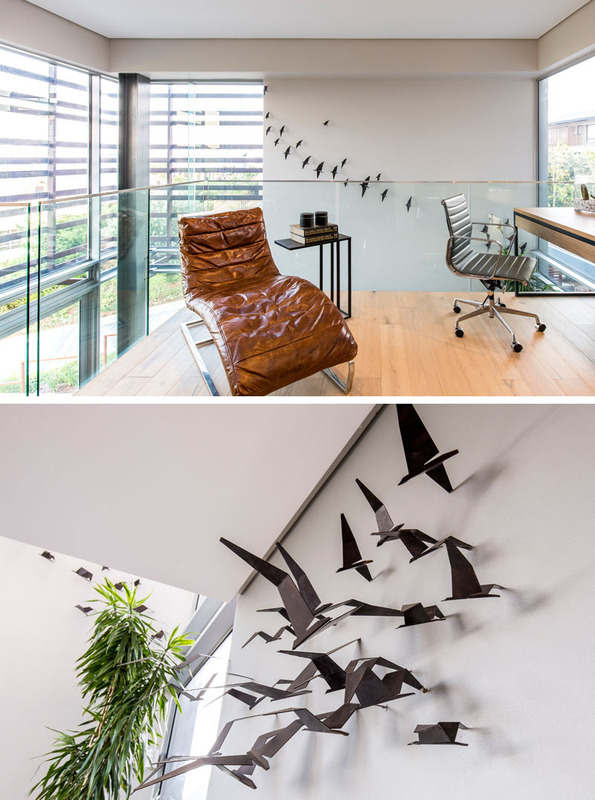 A 3D steel art installation of flying birds, designed by the home owner, decorates the far wall. In the master bedroom, gold wall paper behind the blue upholstered headboard reflects light from the wall mounted lights on either side of the bed, and the hidden lighting in the recessed ceiling. A small space before the walk-in closet and bathroom provides the perfect spot for a wood vanity with a large rectangular mirror, and a delicate wood chair. The all wood, walk-in closet separates the master bedroom from the ensuite bathroom. A unique textured chandelier centres the closet, while hidden lighting on the floor adds a warm glow. 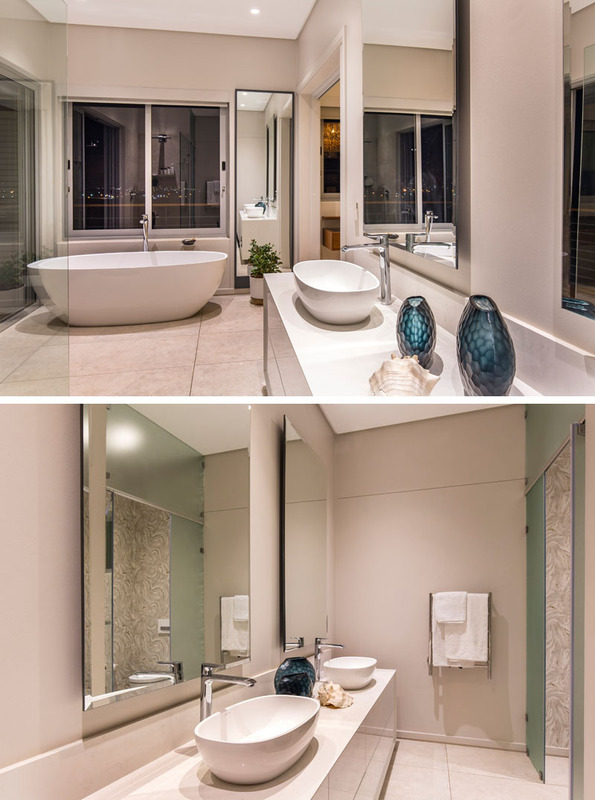 In the master bathroom, a white standalone tub is placed beside a large window providing a view of the city. 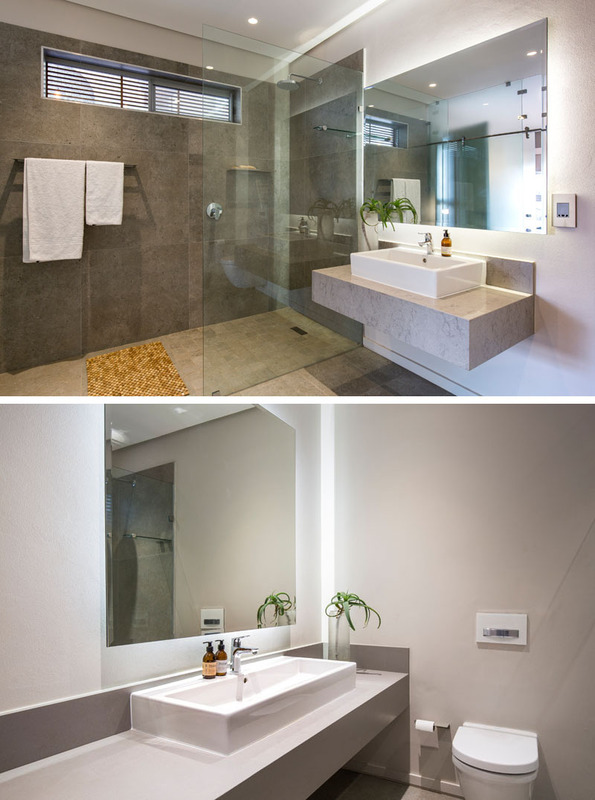 In front of the glass shower, his and her sinks sit on top of the white counter. In this fun and tropical inspired bedroom, shades of pink, purple, and blue are used in the decor and fabrics to compliment the bright and colorful, flamingo wallpaper used on the accent wall. Colorful paintings, bright fabrics on the bed, and the light green headboard stand out against the dark blue accent wall in this bedroom. 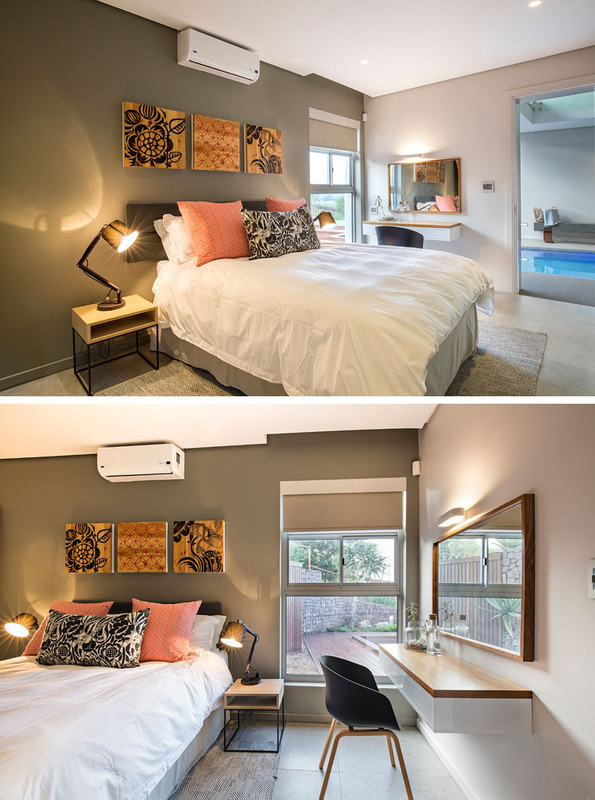 The large mirror beside the bed, reflects the ceiling lights used in this room. 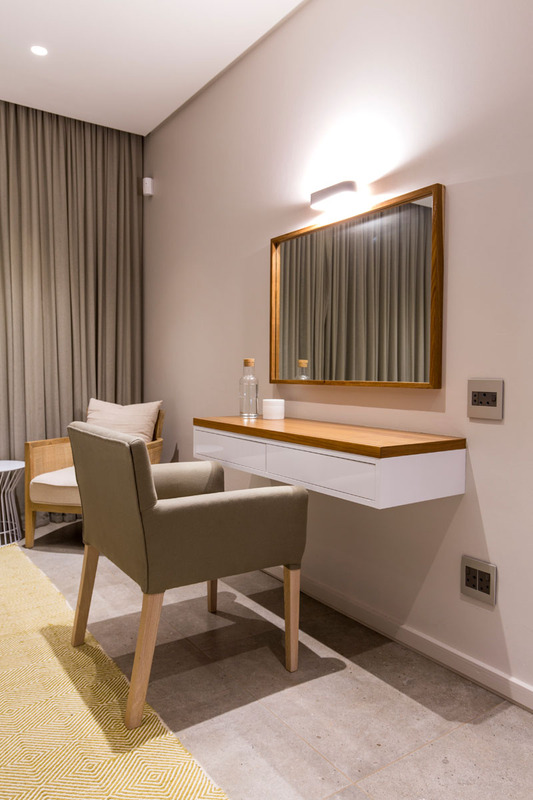 On the opposite wall, a wood framed mirror hangs above a white vanity/desk that also has a wood top. The large shower in this bathroom is defined by the stone tiles and glass shower surround. 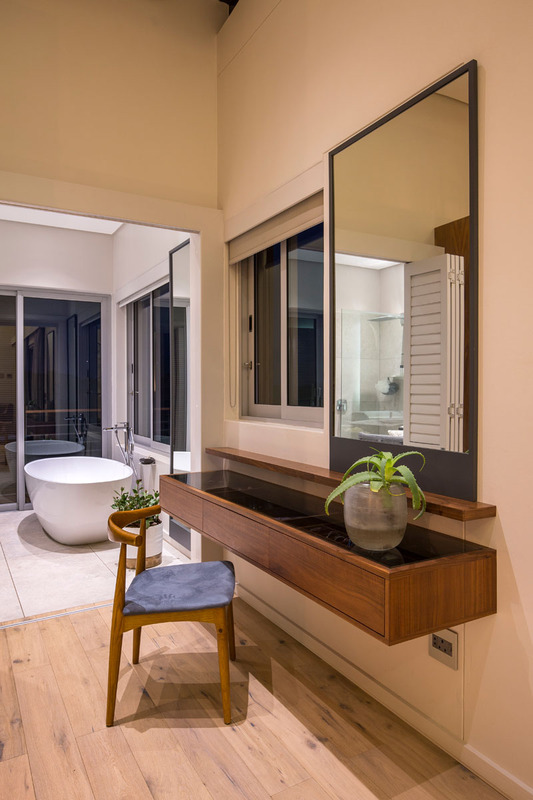 Next to the shower is a floating vanity and backlit rectangular mirror. Off to the side, a separate space is provided for the the toilet. 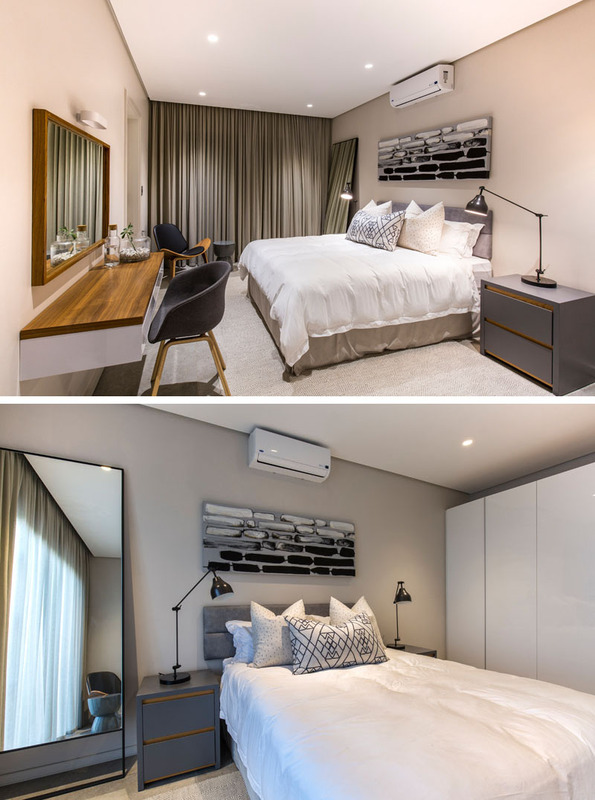 In hues of grey, black, and white, this guest bedroom is modern in design. The dark grey bedside tables, and the large light colored wardrobe, provide plenty of storage in this room. 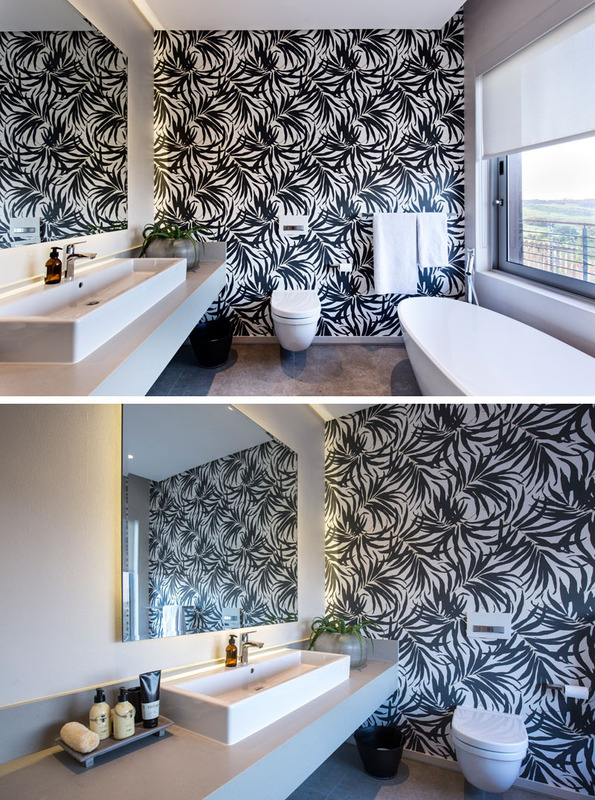 The black and white wallpaper on the accent wall of this bathroom is bold, making the white bath, toilet, vanity and decor standout. A large window with a white pull down privacy blind, provides views of outside when wanted. 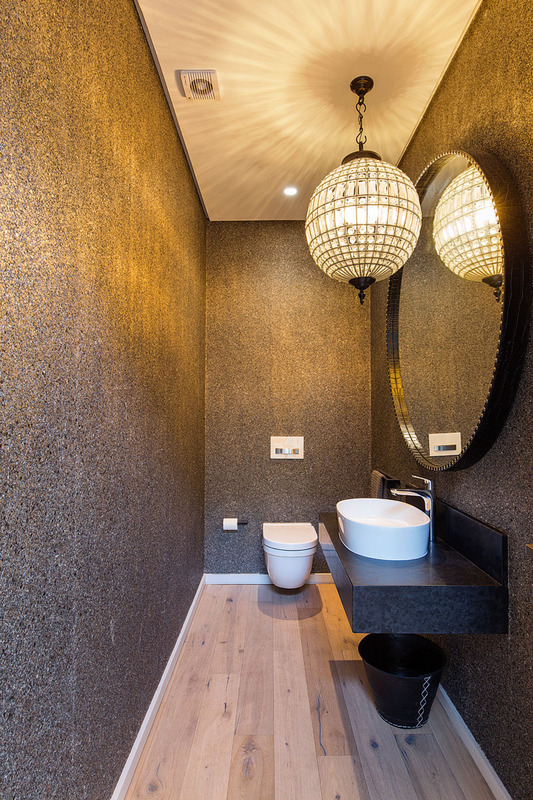 The large glass pendant light in this guest bathroom casts shadows onto the ceiling, and gold hues onto the walls. 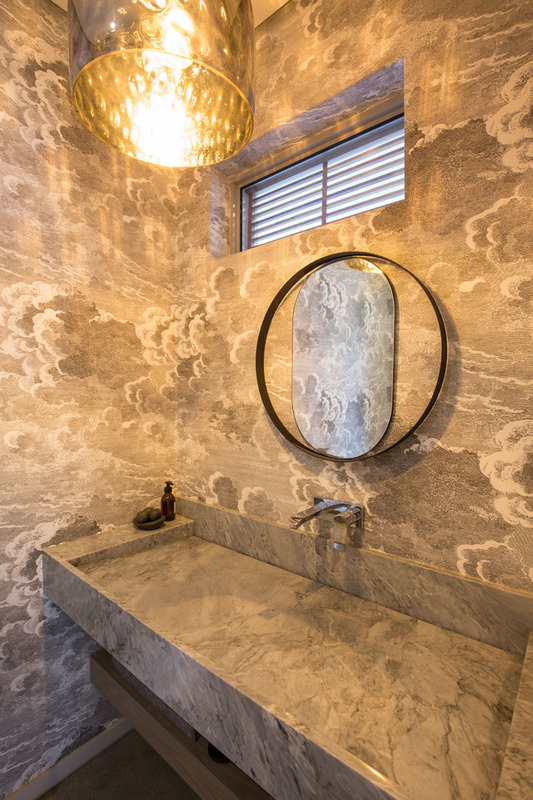 The grey and white cloud wallpaper compliments the large marbled stone inlaid sink, and textured pendant light in this bathroom. 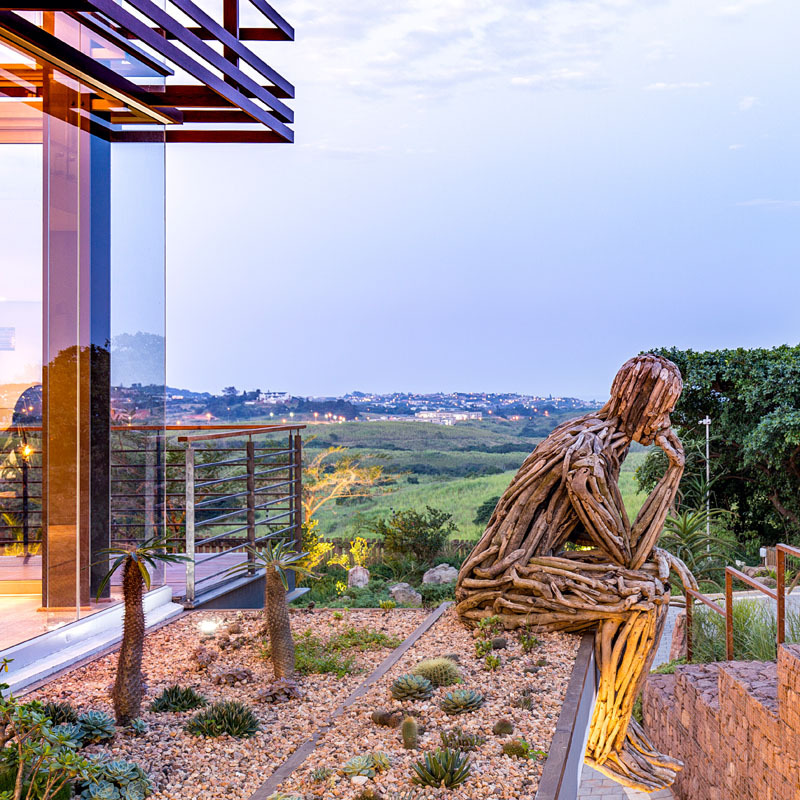 Another large wood art installation, the thinking man, sits in front of a mini rock garden and looks out over the side of the house.